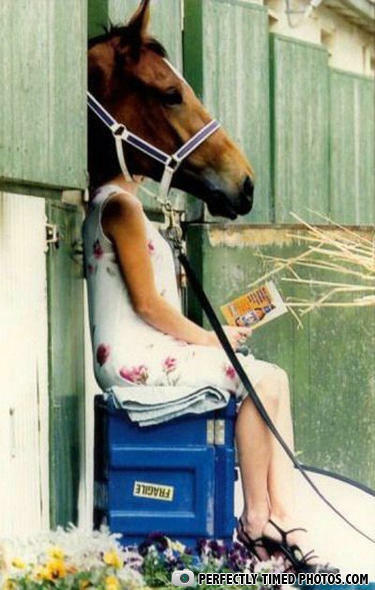 Sarah Jessica Parker! What are you doing here?! "How to Open Beer Bottle's With Your Mouth"
How come a transvestite donkey witch is tanding next to you and why is it wearing a dress? Hi my name is Sarah, do you like my new facelift? Hey... why the long face? I had a feeling that a Sarah Jessica Parker joke would be the highest-rated comment. It's still funny, though. I've heard about horsehead network, but that's just ridiculous! She's fragile. Don't mock her. If I have $5 and Chuck Norris has $5, we both have the same monetary value.